Alberto's V05 is not my grandma's shampoo anymore. Growing up and staying over, V05 was always in her shower. I just figured it was for "grandmas" and would use it when I slept over but never bought myself. Alberto V05 now has Salon Series with 11 Revitalizing Oils. I was first introduced to their new line, at an event in June #GettingGorgeous, they had their full line on display, I had no idea how many different types of V05 were out there. 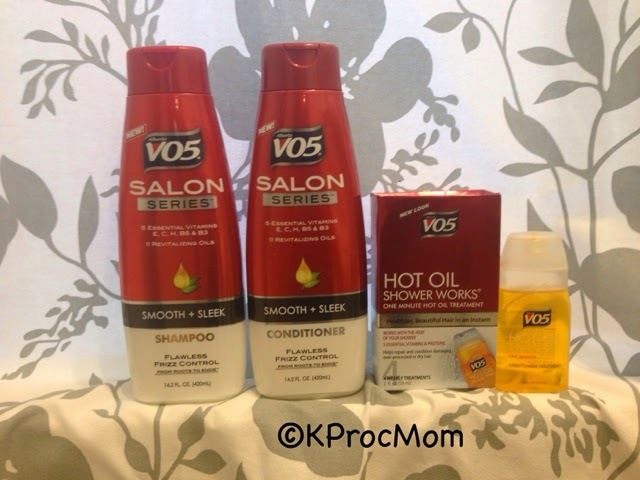 Then, I was asked to try their new Smooth & Sleek- Shampoo and Conditioner, Anti-Frizz & Shine Styling Cream, Perfect Hold Non-Areosol Hairspray and Hot Oil Moisturizing Shower Works. I tried them in different combinations depending on how I was styling my hair, if I went swimming and how long between washes I went. The prices points for Albert V05 Salon Series is extremely affordable $5 or less on average and sold in most locations. Smooth & Sleek- Shampoo and Conditioner: I thought it was good, a slight fragrance in both helping my hair smell nice. I did use Conditioner twice to get the silky feel I want when I wash my hair. That would be my only gripe of using more then usual. Once rinsed out, I had very little tangles to comb through so using it twice worked very well. 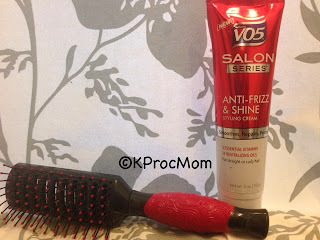 Anti-Frizz & Shine Styling Cream: This can be used on wet or dry hair, although I prefer wet/damp before I style. Making my hair frizz less as the day goes on, I have straight hair naturally but throughout the day it starts to "stray" using this keeps it tame. If I add the straightener to make it super flat, this lasts even longer. 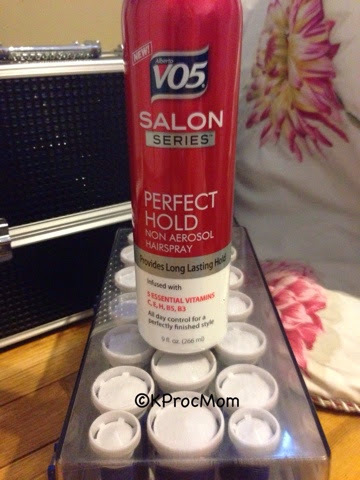 Perfect Hold Non-Areosol Hairspray: This was a favorite, I used it in combination of using hot rollers in my hair. It was light on my hair and keep my curls in for hours. I used it while setting them and again once they were all out to do the final spray in my hair. My curls lasted 4-5 hours longer then usual, I was very happy how well this worked for a non-areosol spray. Hot Oil Moisturizing Shower Works: It was easy to use without having to add heat, just put it in and wait a minute. This is great especially in the summer with chlorine, sun and general damage, weekly hot oil treats help work on saving hair and making it healthier each time out in the sun. I have been using this and bought more already for my hair. I will be adding these into my rotation of shampoos & conditioners from now on and the products are sitting on my shelf to be used already. Do you want a chance to win a set from Alberto's V05? All 5 products review above can be yours! Disclosure: I received these items free from Alberto V05 to review. As always all opinions/experiences are 100% my own.